If you're in search of a casual yet incredibly stylish look, pair a navy blazer with black skinny jeans. As well as very comfortable, these garments look stunning when worn together. Add Paul Andrew rhea slingback pumps to your getup for an instant style upgrade. For an outfit that provides comfort and fashion, reach for a black cutout sheath dress. When it comes to footwear, this ensemble pairs well with Paul Andrew rhea slingback pumps. If you love staying-in clothes which are stylish enough to wear out, you should consider this combination of a black leather biker jacket and burgundy leather leggings. Amp up the cool of your ensemble by wearing Paul Andrew rhea slingback pumps from farfetch.com. 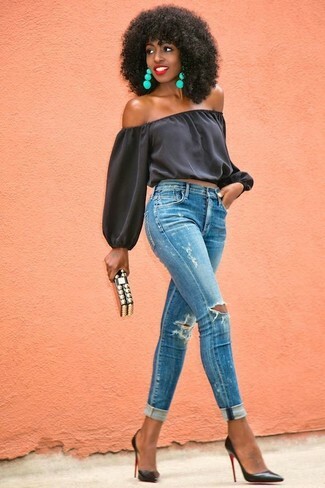 We're all looking for comfort when it comes to dressing up, and this combination of a black off shoulder top and blue ripped skinny jeans is a vivid example of that. Rocking a pair of Paul Andrew rhea slingback pumps is a simple way to add some flair to your getup. If you're searching for a casual yet totaly chic ensemble, opt for a navy coat and white skinny jeans. Both of these items are super comfortable and they will also look fabulous when paired together. Round off this look with black leather pumps. If you're in search of a casual yet seriously chic getup, wear a red open cardigan and black skinny pants. Both of these garments are very comfy and look great when worn together. Play down the casualness of your outfit with Paul Andrew rhea slingback pumps. If you're looking for a casual yet incredibly chic outfit, opt for a navy turtleneck and an olive sweater dress. Both of these garments are very comfortable and they will also look amazing paired together. When it comes to shoes, this look pairs really well with black leather pumps. If you're after a casual yet absolutely stylish ensemble, make a white sleeveless blazer and black dress pants your outfit choice. These garments are super comfy and will look fabulous when worn together. Add a glam twist to your getup with Paul Andrew rhea slingback pumps from farfetch.com. Opt for a brown leopard bomber jacket and a brown leopard bodycon dress for an unexpectedly cool ensemble. And if you want to instantly up the style ante of your look with one piece, add Paul Andrew rhea slingback pumps to the mix.